Monday | 2 Hours Fun, Sport & Socializing, Badminton 🏸Anyone? 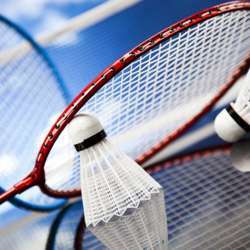 You must be a member of the Dubai Badminton Group to attend this activity. Would you like to join this group? ✔Sport ✔Fun ✔4 courts ✔2 sold hours ✔Shuttles ✔Friends ✔Any level ✔New players always welcome ✔Beginners more than welcome. Some spare rackets available for new players. Please subscribe ONLY if you are going to join!